Pennies In My Pocket Blog: Holy Soft Sheets ... these are cheap! 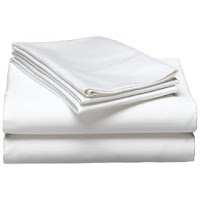 Holy Soft Sheets ... these are cheap! I do believe everyone should endulge in some high thread count sheets at some point in their lives. Those look wonderful...I may just order a set for myself. I agree, sateen is the ONLY way to go! Wow..great deal! Looks like King is out, but good thing I have a Queen! Thanks! I neeeeed new sheets! Made it too late. I just checked it out today and they're back up. Bummer. Thanks for the suggestion, though. I didn't have time to leave a comment yesterday, but wanted you to know that I did pick up some of these sheets with this deal! So glad I did because of course the price is back up and they are out of almost everything. I love nice sheets. Love them, Love them, Love them. We love sateen here too! And at least 1000 thread count. Even my husband is spoiled now :-)! We love nice sheets!